37 year old man from Africa who immigrated to United States 6 months ago presented with left foot pain and swelling which had been present for about 10 years, with occasional fluid draining from the top of the foot. He denied fevers. He reported he had a thorn stuck on the top of his foot when he was 10 years old, had swelling initially which subsided. About 10 years ago, he developed worsening swelling in his left foot, a needle biopsy was done about 4 years later, which he did not know the results of but after that he started to have intermittent draining from small pores, near biopsy site. 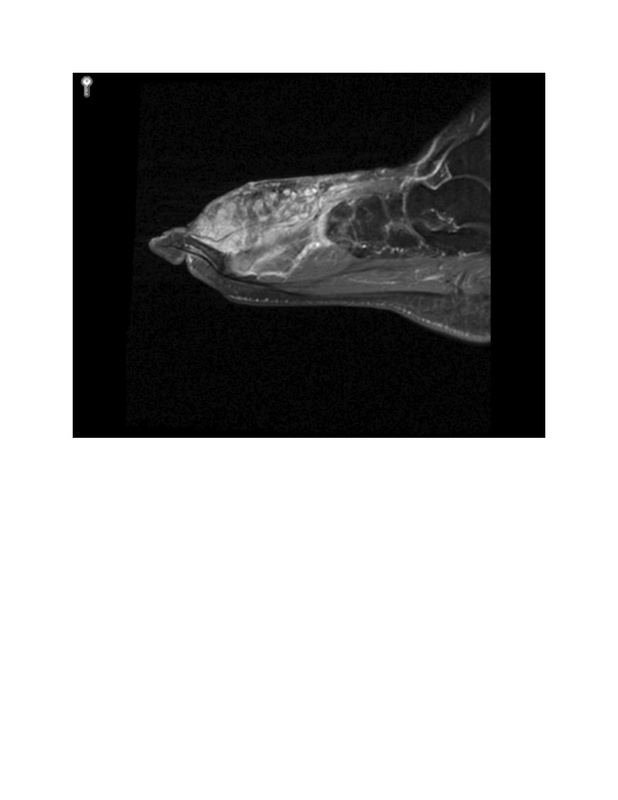 MRI of his foot showed avidly enhancing insinuating soft tissue mass on the dorsum of the foot with possible serpiginous vascular channels. Differential included benign cavernous hemangioma, synovial sarcoma, or other soft tissue sarcoma. Bone marrow edema and cortical osteolysis at the third metatarsal head concerning for chronic osteomyelitis. He underwent I&D which showed several nodules with purulence, chronic scarring. Frozen section was suggestive of Actinomyces. Biopsy showed filamentous fungal elements, marked acute and chronic inflammation necrosis and fibrosis. Fungal culture was positive for Acremonium species. Mycetoma is a chronic infection of the skin, subcutaneous tissue and sometimes bone characterized by discharging sinuses filled with organisms. Mycetoma commonly involves the foot and is endemic in the tropics and subtropics, namely Africa, Mexico and India, and is named after the Madura region of India where it was first described in 1842, hence the name ‘Madura foot’. Also sometimes referred to as ‘watering can foot’ because of the draining sinuses. Infection can be caused by true fungi where it is known as Eumycetoma or by filamentous bacteria of order actinomycetes where it is known as Actinomycetoma. Therapy of these two groups is entirely different, thereby necessitating the need to differentiate. Both the fungi and the actinomycetes are found in soil and plant material in tropical regions. The organism is inoculated into the skin by a minor injury, for example, a cut with a thorn when barefoot. Organisms capable of causing eumycetoma are distributed worldwide and include at least 30 hyaline and pigmented species of molds. The predominant pathogen is Madurella mycetomatis, which, along with Madurella grisea, Leptosphaeria senegalensis, and Pseudallescheria boydii/Scedosporium apiospermum, are responsible for more than 90 percent of cases. Grains, which are actual colonies of infecting organisms are deposited in infected tissues and partially broken down via a neutrophil-mediated inflammatory reaction. Their remains perpetuate an inflammatory response. The presence of the characteristic triad of tumor, sinus tracts, and macroscopic grains is useful for establishing a clinical diagnosis. Treatment of Eumycetoma consists of prolonged drug therapy, at least 12 months. The role of surgery is limited; if pursued, surgery should always be performed in conjunction with antifungal therapy. Actinomycetoma can be cured with surgical debridement and appropriate antibiotic therapy. Mycetoma presenting with pain and swelling can appear to be a soft tissue tumor on initial evaluation. Analysis of grains will help to establish diagnosis and guide treatment. In our patient Frozen section was suggestive of Actinomyces. Fungal culture was positive for Acremonium species. He was treated with Voriconazole and Bactrim for more than 12 months with significant improvement. Pareek A. A Case of Swollen Painful Foot: Mycetoma Foot. Abstract published at Hospital Medicine 2016, March 6-9, San Diego, Calif. Abstract 726. Journal of Hospital Medicine. 2016; 11 (suppl 1). https://www.shmabstracts.com/abstract/a-case-of-swollen-painful-foot-mycetoma-foot/. Accessed April 26, 2019.